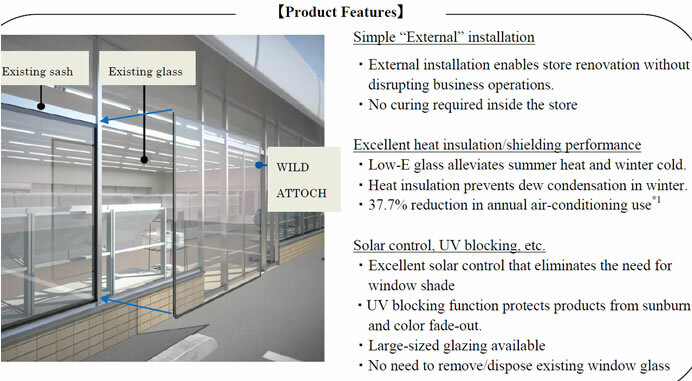 WILD ATTOCH from AGC (Asahi Glass) is a Low-E glass ideal for energy-saving renovation of single-story retail buildings. AGC will release the glass in the Japanese market. WILD ATTOCH is heat-insulating/ shielding Low-E glass with excellent energy-saving and solar radiation control performance. The special feature of this product is that the installation is done from outside of the building. By adding a layer of Low-E glass to the existing windowpane from outside, WILD ATTOCH will reduce annual air-conditioning use by 37.7%. The external installation method enables retails shops to do energy-saving renovation without closing the store or removing the products displayed by the windows. WILD ATTOCH is an outdoor version of AGC’s ATTOCH, which was released in October 2012. While indoor installation ATTOCH is suitable for energy-saving renovations of office buildings, WILD ATTOCH is the wildcard for renovations of single-story retail buildings.